TextSanta.net allows children everywhere the opportunity to experience the magic of Santa by getting their own personalized text message from Santa himself! A great way to spread holiday cheer, and help a child to believe is by sending them a Christmas text message from the one and only Santa Claus! TextSanta.net is a service that allows anyone to send a special person a message from Santa. Customers can choose from existing personalized messages or create a one of a kind personal message of their own. Many parents find that a text from Santa can help spread holiday cheer, solidify that Santa is real, and help encourage good behavior. Customers can send a quick text for just $4.79, or choose the Text Santa Gold Package where they can schedule three personalized text messages plus optional Christmas morning text for only $6.59. 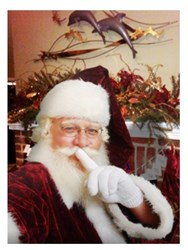 "My children loved their text messages from Santa! Their jaws hit the ground when I freaked out and said 'Santa sent me a TEXT!' Even my 12 year old was stumped as to how it happened! They could not believe it! Thank you TextSanta.net for your continued support of our wonderful children." said user Chris Bilodeau. $1 from every TextSanta purchase will be donated to the Children of Fallen Patriots Foundation. The Children of Fallen Patriots helps give a debt free education to children who have lost their parents in the line of duty. This foundation gives scholarships and educational support to military families who otherwise may not have had the same opportunities. By purchasing a text message from TextSanta, customers are helping honor fallen patriots and the sacrifice they have given to all Americans. For an even more magical experience, parents also have the option to send their child a picture of Santa in front of their mantle or Christmas tree. All they have to do is upload a picture of their home's mantle or Christmas tree to PicSanta.net and the elves will handle the rest! TextSanta was established in 2008 and has given thousands of children joy each Christmas season. Schedule a text message today or learn more by visiting http://www.textsanta.net.